Walking vs. Running: Which is “Better”? What weighs more: a pound of feathers or a pound of bricks? Just as you may be tempted to shout “bricks” (as I would often do right up through eighth grade, when the subtleties of this riddle and “no soap radio” were finally explained to me), you may be tempted to assume that running is the greater “burn” of the two exercises. And, like all questions in fitness, I remind you that nothing is ever as simple as it seems. Walking is, by nature, low impact: there is significantly less impact as the foot hits the ground and, consequently, the lungs have a greater opportunity to provide the much-needed oxygen. Therefore, the heart rate does not get as high with walking. But that’s the linear thinking I hate. I love watching runners, real runners, because they make it look so effortless. Even sprinters try to relax their bodies as much as possible so that they may put the effort where it will best suit them and not energy is wasted through worthless tension. Running mid- to long-distance is, ideally, an opportunity to use gravity and and momentum to your advantage. It takes time and practice to get used to, but once you understand the effortless form, running becomes relaxingly meditative. Walking can be a wonderfully leisurely pass time. Go for a stroll in the park, pause, watch the birds, pause, stroll some more. Certainly the calories burn is there, and, if you have been inactive it is a GREAT way to get started in an active lifestyle. But the burn is not as significant as running for the same period of time. 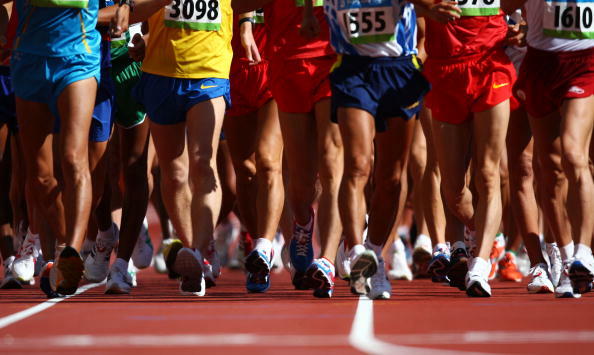 But let’s take a look at race walking. 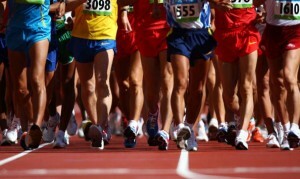 There is nothing low key about race walking and trying to maintain a rapid pace over a period of time and/or distance. Quite the opposite: the body has to work extra hard because, instinctively, we tell ourselves to break into a jog or a run when moving that quickly. The muscles of the legs, the glutes, the (gulp– help me) core, as well as the chest, arms, shoulders and back all have to work to create the momentum to move at such a speed. 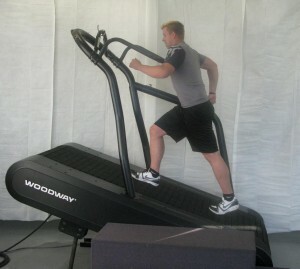 Increase the incline that you’re walking on and you will increase the exertion level. Increase the amount your work your arms, and again, the level of exertion, and consequently your heart rate and calorie burn go up as well. Always warm up before you start race walking for exercise. You might think “walking….what’s the big deal?”. But it is a big deal and you should warm up to get the blood flowing. When you walk, think about standing as tall as possible, lifting the base of the skull to the sky and not the chin. Your chest should be lifted and your jaw should be nice and relaxed. As you walk, take small quick steps. Let the heel of each step fall just in front of the toe of the previous step. This will give you a much smaller, faster stride. Use a heart monitor to gauge your exertion level. If you want to increase your heart rate, try an incline, faster steps, or greater arm movement, even working to take the arms over head as you walk. If you are just starting out, be conservative. Try the small step, quick pace idea but move a little slower than you might like. You’re going to feel a whole bunch of muscles you never knew you had and you don’t want to shoot yourself out of a cannon.